Overview of the Antara complex ... an artist’s impression. The $199-million Antara residential complex will be home to 520 expatriate families and will be a significant landmark in Riyadh’s urban landscape. 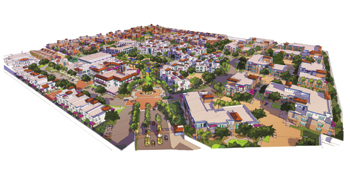 Construction work has been launched on a premium residential project, which has been designed as a self-contained Mediterranean resort-style village, with the laying of the cornerstone last month in Riyadh, Saudi Arabia. The SR748-million ($199 million) Antara residential complex will be home to roughly 520 expatriate families, once completed in October 2016. Gulf Related, a leading regional real estate development company, is the development manager for the project, while the main contractor is Drake and Scull Construction (DSC), the general contracting division of Drake and Scull International (DSI), which was awarded the SR487-million ($130 million) contract last September. Under the terms of the agreement, DSC will complete all the civil, architectural, and MEP (mechanical, electrical and plumbing) works, including structural, and external works for the residential and ancillary buildings on the project site. Strategically located in the growing Al Dir’iyyah Governorate, northwest of Riyadh on King Khalid Road, and situated 10 minutes from King Abdullah Financial District and 20 minutes from King Khalid International Airport, Antara is a state-of-the-art residential area with a distinctive character in the Riyadh metropolis, says Emile Habib, managing director of Gulf Related. “It will serve as a model residential development for the expatriate community in and around the capital and will be nothing less than a captivating world-class development,” he says. The large integrated development encompasses a built-up area of 98,115 sq m, consisting of 520 homes in a park-like landscape. It includes 12 apartment buildings with a total of 267 apartments, 70 duplexes, 151 villas as well as 32 short-stay apartments in the village centre. Full community amenities will also be provided in the 157,300-sq-m development, featuring a pre-school, village market, main clubhouse, and administrative building with sports and fitness centre; tennis, basketball and volleyball courts and bowling and billiards centres; barber shops; library, book stores, restaurants, cafes and community lounges. Other infrastructure facilities will consist of a utility building, security gates and guardhouses, car parking, landscaping, and pedestrian paths, with 40 per cent of the total development, or about 48,500 sq m committed to open areas, lush green landscaping, cycling tracks and children’s play areas. Enabling and underground infrastructure works were completed late last year. Antara was masterplanned by Otak and the world-renowned Edsa, out of Fort Lauderdale (US) with offices in Abu Dhabi, UAE, which also designed the generous landscape architecture. The infrastructure, building architecture, interior design and engineering was designed by Omrania and Associates out of its Riyadh and Bahrain offices. This is Gulf Related’s first project with DSC in Saudi Arabia. Alameddine says they were looking for an established contractor which could offer multi-disciplinary services and expertise for this landmark project and the company came out as a “best-in-class partner”. Gulf Related was formed as a joint venture partnership between Gulf Capital, a leading regional alternative asset manager and The Related Group, a prominent real estate firm in the US that focuses on investments targeted at high-end, mixed-use real estate destination developments in the Gulf.